The modern public safety is in a desperate need for broadband data connectivity. The modern public safety organizations demand access to databases like patient records, criminal registers, stolen car registers and even building drawings. A key imperative is that this data is always up to date, since otherwise our security and health is endangered. Other recent demands include biderectional video from and to vehicles as well as various online blogging posibilities. All of these new services are needed to improve the efficiency of the organizations and ultimately safety of the people. Up to date data connection between vehicles and headquarters saves lives! Secure connectivity is what public safety data solutions are all about. While the first part of the term (security) receives much of the focus from various advanced VPN solutions, the second part (connectivity) is too often overlooked. And connectivity is key, especially for those who work from their vehicles in public safety. 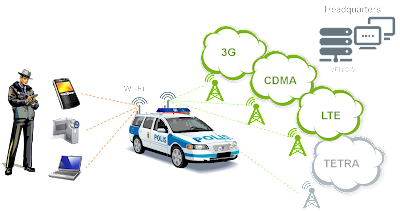 One might assume that TETRA networks, broadband networks, or the future LTE networks provide what is needed. Unfortunately, that is not the case. First, current TETRA networks don’t provide data connectivity up to today’s standard of services. TETRA is built for voice, and using data over the network often either distracts this main functionality or in cases totally disables it. Second, the current commercial wireless broadband networks are not reliable. As recently documented in Helsinki Center (one of the best spots for 3G in the world), even in totally covered areas, a single 3G network occasionally provides as low as 70 percent availability in vehicles. Third, if you wait for the LTE to come and solve all your problems, you’re going to have to wait for a long time. LTE is not yet capable of providing the uptime needed for vehicles, and it will be awhile until it is able to do so. The ultimate solution for public safety vehicles is to use all of the available network technologies in an intelligent way. TETRA needs to be reserved for voice, and data should be transmitted over TETRA only when absolutely necessary. To ensure broadband availability, two or three commercial broadband networks should be used. As LTE roll-out starts, new technology should be incorporated as soon as possible in regions where it is available. With a solution this comprehensive and varied, a mobile router capable of great flexibility is required. The router must be able to switch between networks, always selecting the best one. It must be managed remotely for security purposes and minimized operational costs. It must also eventually bring Cloud Services to the vehicle.